Last week I was lucky enough to go on a school excursion with my daughter and her Grade 2 class. We headed into Brisbane to the Queensland Museum to learn about insects, metamorphosis and their life cycles. Lots of fun was had and I am sure the kids learned some new things, but the highlight for most (some were a little scared) was holding the stick insects. Each class was lucky enough to take home 4 little young stick insects to care for and watch them go through the different life stages. required a new, more secure home. Being the weekend I volunteered to take them home and find/make a home for them. So a fun family project resulted in a grand architectural masterpiece (if I may so so myself lol) for these very lucky stick insects. We created a home out of a styrofoam esky, cut some window sections out and covered them with a fine fly screen and what was the lid became the swinging door to get in and out. With a bottle cut in half and secured to the bottom to hold their gum leaves their home was created. Stick insects are fascinating with their amazing camouflage, varying sizes and different colours. They are harmless, take up little room and are very low maintenance as a pet. This along with an educational experience of learning about the insect life cycle make them a great pet for both the home and classroom. Although they aren’t cuddly pets you can touch/hold them and they will climb on you, just be careful that they don’t get a leg caught in fine weave clothing as it may break and handle with care! To house a stick insect they simply require a tall container to live in. Something like a styrofoam esky on its end, an aquarium/tank stood on the end, two pots joined together to make a cylinder or a tall vase it covered top. Just make sure that they have breathing air holes, or use fly screen or fine mesh to allow air to get in. They are very low maintenance pets, not requiring a lot of care. 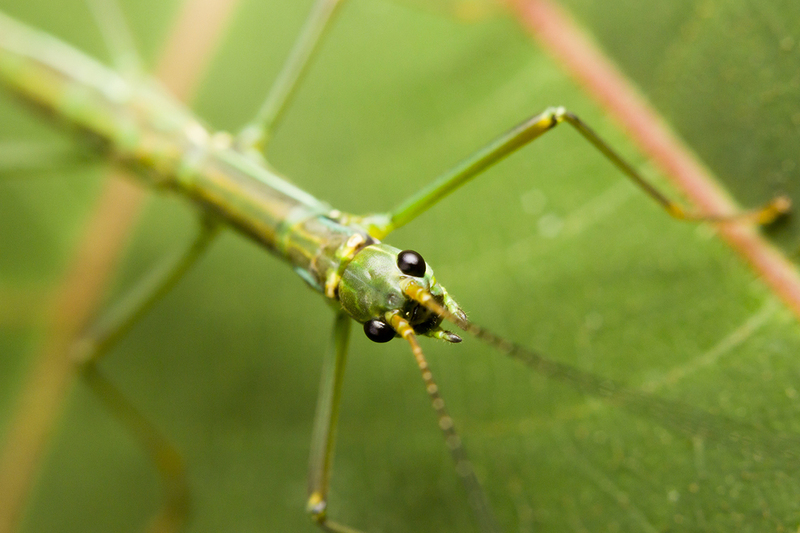 Stick insects are vegetarians (not to be confused with preying mantis) so they only eat leaves. A fresh supply of tender gum leaves in the enclosure is all they need, changing them a couple of times a week to ensure they are fresh. If they aren’t eating the ones you supply try changing for a different species/tree, and ensure they haven’t been sprayed with any chemicals. 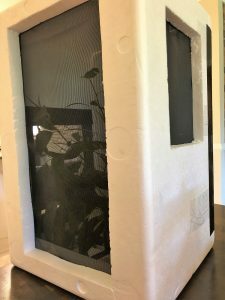 For water they just require their enclosure to be kept humid, not wet, just a light spray of water on some of the leaves a couple of times a week will be enough. 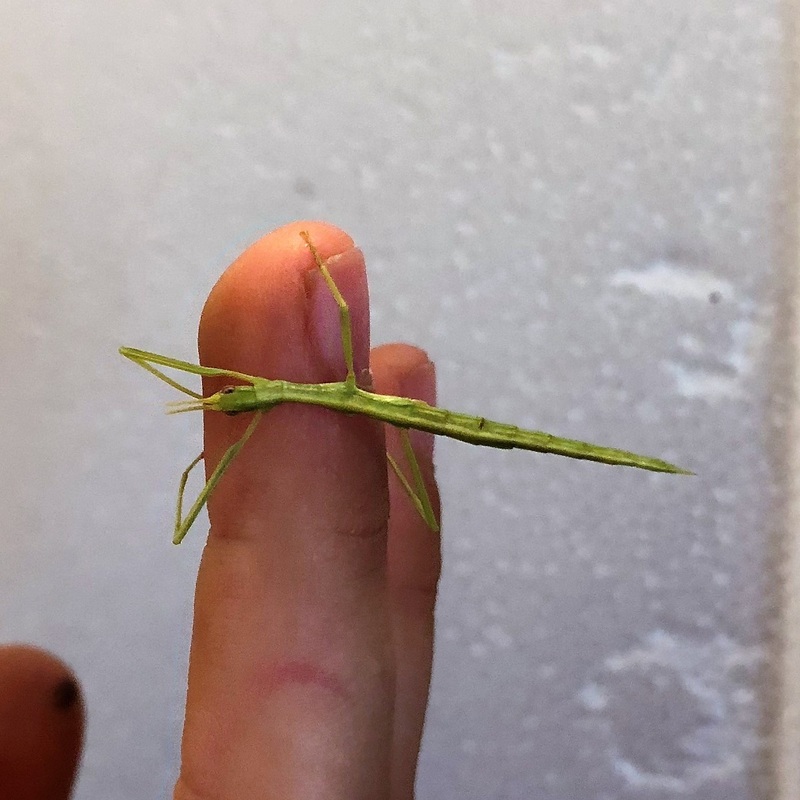 Stick insects make a very interesting pet and can be a good option for a child or family looking for an easy low maintenance pet with an added bonus of being educational by teaching kids (and adults) about the different insect life stages. A stick insect will take about 2-3 months to become an adult and then can live for up to one year. Hopefully these stick insects that my daughters class bought home survive long enough for them to learn about the life stages of insects, hopefully moulting and going through metamorphosis for the kids to see what they have been learning about. For more information on keeping stick insects as pets or where to get some (because yes you can buy them online and have them posted you, amazing right?) please visit Minibeasts Wildlife’s Bugshop.